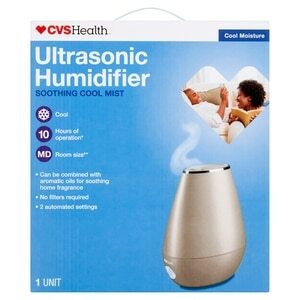 **Medium room size is estimated at 215 sq ft.
CVS Health Ultrasonic Humidifier helps to prevent excessive dryness in your home. With ultrasonic mist that absorbs into the room's atmosphere quickly, the humidifier can help reduce static electricity, provide a more comfortable night's rest, and prevent dryout damage to plants and furniture. Adding aromatic oils to the humidifier helps dispurse soothing fragrance throughout the room. How It Works High-frequency vibrations release tiny drops from the surface of the water. The fan air flow transports the humidified air out into the room. If you wish, the device can be used with aromas.